such as native bees, butterflies, flies, moths, beetles, and bats are essential for human survival and their populations are in serious trouble. Our fuel, food, drugs, and fiber are directly and indirectly taken from plants that depend on pollinators for their existence. One out of every three to four mouthfuls of food we eat results from the actions of pollinators! Pollinated crops contribute an estimated $20 billion to our economy each year. 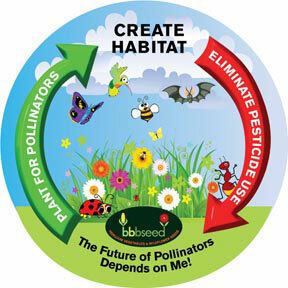 Native pollinators control the healthy function of our natural ecosystem. The documented decline of native pollinators, as well as that of the introduced European honeybee, should concern everyone. This decline resulting from the fragmentation and destruction of native habitats has reduced the food sources for many native pollinators. The traditional corridors of nectar- and pollen-rich plant sources have been destroyed by development and changes in land use. Isolated habitats are further degraded by non-native and invasive species. Misuse of pesticides and introduction of non-native pollinators have contributed to the extinction of many of our native species. 1. 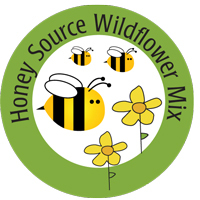 Increase the forage (food) for pollinators in your yards and gardens. Here are 4 great seed mixes to plant for great forage! Click Here for some ideas and a list of great plants. 2. Education – Bee informed. Learn about how pollinators provide 1/3 of the food we eat. 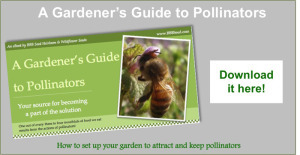 Watch the pollinator activity in your yard or garden and take note of the plants they visit. Share the knowledge with your friends and neighbors about their importance. 3. Eliminate chemical use in your yard, garden and home. 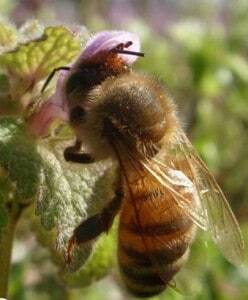 More on Bees and Pesticides Thanks to Colorado State Beekeepers Assoc. 4. Throw in your financial support. There are many organizations that are working hard to preserve our pollinators and their habitat. Take a bit of time to find ones that would be helping in your area or even on a national or international level. 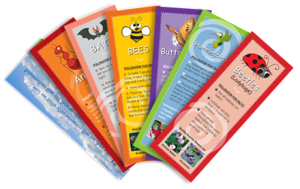 Enjoy these fun, colorful bookmarks created for National Pollinator Week. Use them for educational tools, fun giveaways or impulse purchase items at the sales counter. Representing 6 different, very important pollinators with fun facts for each. 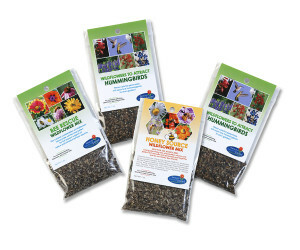 Available in packages of 6, one of each pollinator. Only $0.75 per pack! 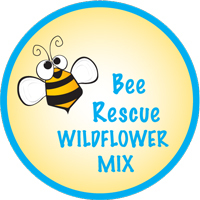 These 1/2 oz tins filled with the pollinator wildflower mixes make great give-aways or fundraisers for your organizations!